In December 1921, North Branch Library opened in a rented building at 25th and Ames Streets that had been a church. North Omaha residents had previously received their library services through a deposit station, but weren’t satisfied because they wanted a place for books and other community events. By 1937, they asked the Omaha City Council to budget for a more permanent home, having already outgrown the space. By 1938, North Branch found a new home at 29th and Ames Streets. History repeated itself, however, and by the mid-’60s, the building was failing to meet the demands of the community. Residents were concerned about the lack of space for reference books, materials and parking. A partial ceiling collapse in 1965 led many to believe the building had seen its best days. 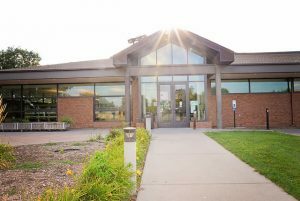 The City Council agreed and resolved to “provide properly the high quality and intensive service which is vitally needed for the community.” In 1972, North Branch opened at its current location, 2868 Ames Ave. The library and its architects, Dana Larson Roubal & Associates, received much praise and several awards for its cutting-edge design. Following the death of longtime Omaha civil rights advocate Charles B. Washington, members of the community petitioned the Omaha Public Library board of trustees to consider changing the name of the branch to honor Washington for his work with young people in north Omaha. The branch was rededicated as Charles B. Washington Library in September 1986. In 2005, a groundbreaking took place. The library’s interior was renovated, and 5,700 square feet was added to the building’s north side. The project also introduced an outdoor sculpture garden featuring “Caged Bird,” two bronze figures with birdlike features and a bronze cage, by artist Yanna Ramaeker. The artwork pays homage to Maya Angelou’s poem of the same name. The branch reopened in April 2006 to much fanfare, including a red carpet rollout for special guest Ice-T.
Today, you will find Charles B. Washington Library bustling with activity. Every week, community groups meet at the library for quilting club, book discussions, computer classes and camaraderie.